THEM Anime Reviews 4.0 - Amazing Nuts! Notes: I've been unable to find an explanation for the title; this OAV neither depicts nor mentions any type of nut (nor is it a dirty pun, as far as I'm aware). Amazing Nuts! is a collection of four standalone music videos, each titled according to the name of its song. The first ("Global Astroliner Gou"), is a police drama set in a futuristic Earth, while the second ("Glass Eye") is a much more abstract CGI piece that depicts a drug overdose and possible suicide. 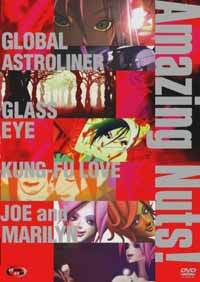 The series concludes with the pairing of the most and least linear segments: "Kung Fu Love", the story of the girl who has become the "enemy of the world", and "Joe and Marilyn", an animated concert video. When it comes to short works, obscurity is rarely an index for poor quality. They typically receive so little distribution and promotion compared to TV shows and feature-length films that many wonderful pieces simply end up being forgotten, and I've generally had a good experience unearthing such "hidden gems". But sometimes, curiosity fails me and leads me to pieces that are, sadly, entirely deserving of their obscurity, and Amazing Nuts! is one of these. While parts of it have impressive animation, the good artistry never manages to make up for the cliched (and occasionally downright incoherent) storytelling and a soundtrack that is, for a "musical" spectacle, depressingly mediocre. Once in a while, Japanese animators pay homage to their American counterparts and vice-versa, and this piece is a prime example. The design, which resembles the work of Gendy Tartaskovy (The PowerPuff Girls, Dexter's Laboratory), is marked by sharp-edged shapes and bright colors, and the animation employs rapid motion and visual layering that fits the action and highlights the art almost perfectly. Some of the scenes would fit perfectly well on Cartoon Network and never be recognized as "anime." I'd give this section a full recommendation if I only had the visuals to go on, and the music, unlike some of the other segments' scores, does suit the section well: it has a dance beat that amplifies the "cyberpunk" setting, and although it's forgettable, it's thankfully also quite unobtrusive. The problem is simply that eye candy doesn't equal good storytelling, and when Global Astroliner Gou does try to deliver a plot, it does it so half-heartedly that it completely throws itself off. The first part employs a number of false starts (the cop who is our "protagonist" appears to fight several different criminals, for example, but not a single incident is resolved), and it meanders so much that it becomes infuriating to follow. The second part then introduces a romance that simply feels cliched, unnecessary, and, when it isn't being irritating or confusing, rather boring. Although the setting is vaguely interesting, nothing annoys me more than directors who refuse to establish or explore their own invented universes, and we learn so little about this one that I soon ceased to care about it. I may have been fine with this segment had it been content to stick with being a music video (since this particular song worked well enough with the visuals), but it shoots itself in the foot the instant it tries to say something. It has nothing going on in its head, and it leaves no impression as a result. Unfortunately, this segment lacks the impressive visuals that saved Global Astroliner Gou from the dump. The main problem is the ugly and stiff CGI, which makes the characters look like marionettes and entirely saps any degree of expression from their faces. The story, meanwhile, drips with what one might call "artsyness": a pretense of artistic skill that hides a complete lack of substance or talent. It attempts to set itself up as something sad, romantic, gloomy, and edgy, and it simply comes across as banal and, in trying and failing to seem sophisticated, manages to prove that it doesn't have a drop in depth in all of its excruciating ten minutes. Finally, the music itself is the most boring yet simultaneously annoying type of electronica. At points it became overpowering enough to drive me to hit "mute", and while I didn't quite give in to that urge, I will say that I hope to never hear the song again. But even without it, Glass Eye feels incompetent, and unless one enjoys making critiques of poor film technique, there really isn't a good reason to watch it, I feel. Like Global Astroliner Gou, this piece is a visual wonder, and like Glass Eye, it attempts and fails to seem deep. Unlike either, however, it does manage to carry a plot. That plot is hackneyed, the dialogue is badly written and full of angst, and yet it does at least succeed at being entertaining, making this the slight best of the four segments. If Kung Fu Love had stuck to being a light-hearted martial arts-influenced music video, I probably would have been perfectly happy. The animation is amazing, for the characters are deftly drawn to look like pieces of construction paper in a collage, and their smooth and striking movement fits the action scenes perfectly. The character design is impressive, and while I can't say I particularly liked the music, it at least fit the mood moderately well. In technical terms, this part is flawless, and even worthy of admiration. At some point, though, the director decided that having an actual story would make it stronger. That story is certainly better incorporated than in Global Astroliner Gou, to the point where it seems about as important as the spectacle, and for the most part, it's genuinely interesting. Unfortunately, it's still rather trashy. It begs one to care for its male and female protagonist and invest in its run-of-the-mill story of elopement, and it entirely invalidates that effort with bad writing, rushed pacing, and an illogical setup. I really don't know how this girl managed to make so many enemies, or why they all decided to attack her the instant she convinced her lover to stay with her, but I do somehow doubt that even the director knows entirely what's going on in his ridiculously unrealistic world. Furthermore, although this short is largely a fun and breezy (if inane) action movie, it edges towards being downright dreadful at a few points when the script becomes frustratingly sexist. The dialogue in the love scenes dwells upon the fact that the girl likes "strong men", and that her lover, in spite of being the typical spineless wimp he is, wants a "girl who needs something to rely on". This sort of setup been done before, and it really just doesn't need to be done again. I don't like damsels in distress, I despise movies that make women out to be weak, and I think that the scene is so unsettling that it almost completely ruins the movie. Taking all of its failings into account, Kung Fu Love maintains enough coherence and entertainment value to work, even if the sexist content manages to make it a bit less fun to watch. Although it isn't something I would seek out, I can commend it on the few things that it does right, and I only wish that those blots hadn't made me me enjoy it so much less. Some stories end on a bang, others on a whimper, and Amazing Nuts! on an animated concert video of the likes of Hatsune Miku. Unless one enjoys the music, which is the bland sort of J-Pop one might expect to find in a third-rate dating-sim anime adaptation's OP, there really isn't any reason to watch it. The CGI is even uglier than that in Glass Eye, and the brief attempt to introduce "drama" at the very end simply made me laugh. It's short enough to not be excruciating, but it's still a waste of time. So is Amazing Nuts! worth anything? The artwork sometimes manages to save it from the trash heap, but the overall result is a boring and frustrating mess whose weak songs made it as worthless to me as a music-lover as it was to me as an anime fan. In my opinion, it's an experiment that just didn't work, and I'm sorry to say that it's not worth saving from the obscurity bin. Recommended Audience: Older kids and up. "Kung Fu Love" depicts pole dancing, and "Glass Eye" hints at (and vaguely depicts) drug abuse and suicide, but the percent of risqué content is fairly low.